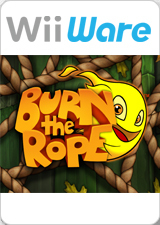 Burn the Rope is a challenging game where you try to burn as much of the rope as you can in each level. The catch is the fire only burns upwards, leaving you to turn the level to keep your flame alive! As you progress through the levels, you'll encounter bugs crawling along the rope which all have different reactions to the flame. The graph below charts the compatibility with Burn the Rope since Dolphin's 2.0 release, listing revisions only where a compatibility change occurred. This page was last edited on 26 November 2017, at 21:57.